Thomas Mapfumo: Lion Of Zimbabwe, In Exile Mapfumo is a cultural and political hero in his native Zimbabwe. He created his chimurenga music during the struggle for liberation from the white minority government in the 1970s. Exiled to Oregon in the late '90s, Mapfumo continues to make music rooted in the Shona tradition. 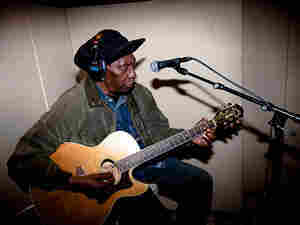 Thomas Mapfumo is a cultural and political hero in his native Zimbabwe. He created his chimurenga music during the struggle for liberation from the white minority government in the 1970s; in fact, the music's name comes from the Shona word for struggle. Mapfumo's subtle yet clear political and social messages led to his arrest by the Ian Smith government, and his music remains rooted in Shona tradition, particularly mbira (thumb piano) music that was suppressed in part out of fear of its religious power. Mapfumo has continued to speak out against political corruption and dictatorial power, but his early support for Robert Mugabe's black government soon turned to pointed criticism in the '80s and '90s, as its policies have led to one-party rule, economic meltdown and international isolation. This also meant that Mapfumo has been forced into exile: He now lives in Eugene, Ore., with his band, and has been unable to even visit Zimbabwe for the past five years. I was very pleased to welcome Mapfumo and his band to my radio show, The Best Ambiance on KEXP, as his music was one of the program's inspirations when it was founded 25 years ago. He had never appeared on the show before. But, while visiting Seattle for a week of performances at Giant Magnet — a great international family festival — Mapfumo stopped by the station to perform four songs with the most recent incarnation of The Blacks Unlimited (all now based in Oregon). Joining Mapfumo on vocals and acoustic guitar were his younger brother and longtime musical colleague Lancelot Mapfumo on hosho (traditional Shona gourd rattles) and congas, electric guitarist Gilbert Zvamaida, mbira player Chaka Mhembere, Chris Muchabaiwa on bass and drummer Ivan Belize. The band started with a song from Thomas Mapfumo's forthcoming album, Exile, in a different style, then continued with more familiar chimurenga songs featuring the distinctive guitar-and-mbira combination that Mapgumo has made famous. Talking to Mapfumo between songs and listening to his story of political songs and exile, I could only hope and pray for better days for the people of Zimbabwe, while still celebrating the sound of modern Zimbabwe that he has created. Originally recorded May 11, 2009. Engineered by Kevin Suggs.